From time to time, I consult with patients who just don’t meet the inclusion criteria regarding Bone Marrow Aspirate Concentrate intervention for arthritis. At the same time, some of those patients are so pharmacologically dependent owing to medical conditions demanding maintenance that I am unable to offer them autogenous hope from their own Platelet Rich Plasma or that which may be created from a patient’s own platelets. While in the minority, as an orthopedic surgeon offering Cellular Orthopedic interventions for arthritis in those unable to undergo a joint replacement wherein the internist deems the procedure unsafe or who seek to avoid or at least postpone a joint replacement; weight loss, physical therapy, cortisone injection and visco-supplementation are short term fixes and not necessarily without potential risks. The real damage to stem cells from cortisone injections became the subject matter of several recent scientific publications. First no harm is what I was first taught in my orthopedic training. Over the past several months, I have sought treatment alternatives for patients as described above; not candidates for current interventions with standard autogenous procedures. Enter the new alternative, allograft. Derived from Amniotic Fluid, the intervention is FDA approved, safe, and in some cases, even covered by third party indemnification. There are many companies offering this treatment alternative and I am investigating the multiple options. Please be aware, amniotic fluid alternatives are not a substitute for Bone Marrow Aspirate Concentrate derived stem cells ; but there may be a place for this anti-inflammatory alternative when established Cellular Orthopedic options can’t be used in an arthritic because of medical co-morbidities such as heart disease, chemotherapy, kidney disease, liver disease, obesity, Diabetes, etc, etc, etc. Amniotic Fluid usage in Orthopedic is not new; there are publications dating back to 1938 in the orthopedic scientific literature. It wasn’t though until the last five years evidently that allograft investigation led to the development of currently available products. You have knee, shoulder, or hip pain. You would like to postpone or avoid joint replacement. You are interested in a second opinion. You were referred to Dr. Sheinkop. Should All Meniscal Injuries Undergo Operative Treatment ? Joint replacement surgery isn’t your only option. Cellular orthopedic treatments offer a viable alternative to invasive, surgical procedures. 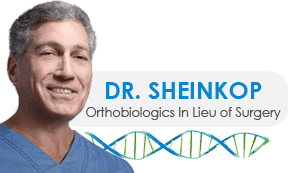 Call Chicago Orthopedic Surgeon Dr. Sheinkop at 847-390-7666 today, or click here to schedule a consultation!